I believe that the mentally and physically challenged are at risk if euthanasia is legalized in SA, especially people suffering from dementia. Full time care is costly and it could be seen by relatives as an easy solution, especially if they are due to inherit a tidy sum. With the physically disabled who are seen as a “vegetable” the same applies, as in the case of baby’s being born with previously undetected deformities. 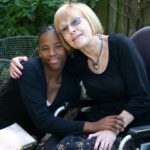 With the advent of abortions, including late term abortions, it is obvious that life has become cheap and easily disposed of and I fear euthanasia would be as much of a threat to, in many cases, voiceless disabled victims. In Belgium a young lady chose assisted suicide because she was depressed. Depression is curable and yet it was agreed to. I refer to a case of a mother of four in the States who has a rare type of cancer. Her medical aid who initially agreed to chemotherapy changed their minds when the euthanasia bill was passed and made a counter offer of assisted suicide.